I'm the first to admit that I haven't gotten my pre-momma mojo back in the fashion department since having baby H. I think that once I go back to work at the first of the year (eek! a couple short weeks! ), that will all change. But in the spirit of linking up with our last Christmas Cheer in the Blogosphere post with Michaela today, I thought I'd spare you my yoga pants and give you a little taste of some baby fashion. How cute is my kid? I mean, seriously. Back at the end of November (almost a month ago, so H was right at three months), David and I took HDawg to visit the Santa at Lenox Mall in Atlanta. We went on a Monday afternoon, so there were no lines. In fact, the entire ordeal only took about three minutes since H didn't exactly have a long list of toys to give to ol' Santy. 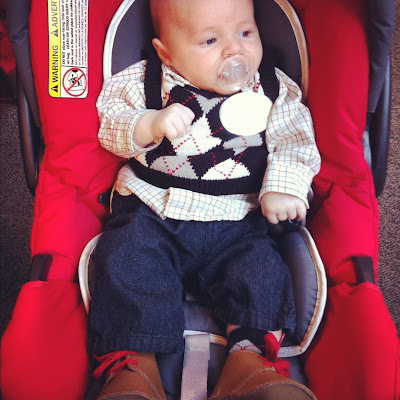 His button up, vest and matching argyle socks (my favorite part) are from The Children's Place and his jeans and moccasins are from Old Navy. I've been surprised at how many cute baby boy clothes they have at the ON. And cheap too, of course. This was my favorite photo from the day. HDawg didn't cry, but he definitely was giving Santa the stink eye. 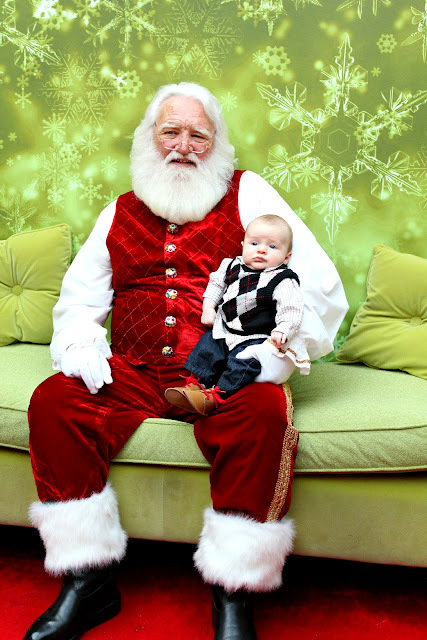 I don't blame him, that big white beard is kind of creepy. 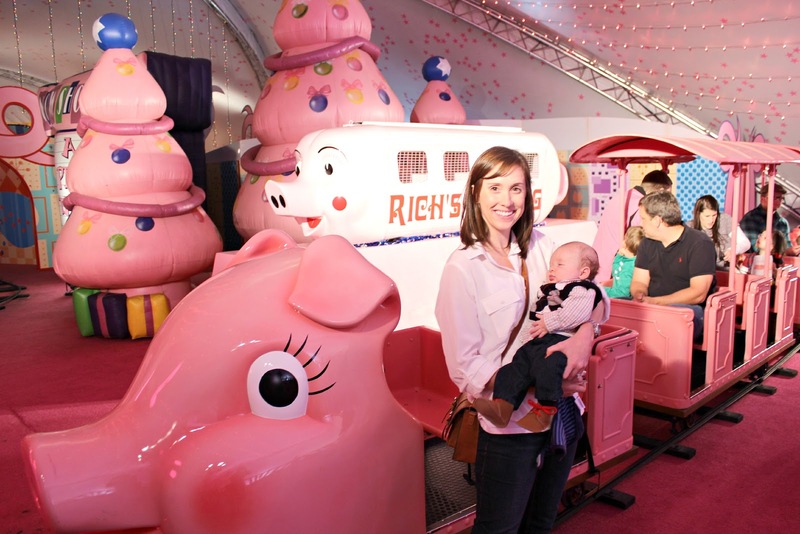 After Santa, we headed over to ride the Pink Pig, an Atlanta tradition. Back in my kiddo days, the ride used to circle around the top of the toy department in Rich's department store. Sounds fabulous, right? Now, it rolls around the floor of the mall parking deck under a white tent. Womp womp. But that's ok- David and I both rode the pig as babes, so we wanted our little guy to have the same Atlanta tradition. Of course, H was too young to be allowed to ride it, so all we got was a photo in front of it. Whatever works, right? So there you have it, HDawg's fly holiday fashion. 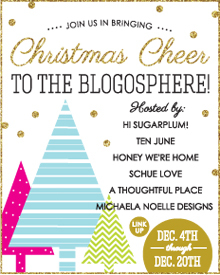 He told me to tell you that he's linking up with Michaela today and you should too... all the cool kids are doing it! He is just too adorable! Enjoy the holiday with your little precious boy! He is just precious!! I love that little sweater!! Ooooh!! The pink pig! :) So nastalgic for me. :) your little man certainly does have style!! Adorable! How old do kiddos have to be to ride the pink pig? My mom wants to take my son when we get in town. H Dawg is pretty fly . . . ! So darling to see him dressed up like that. And how sweet to carry on the Pink Pig tradition. Too cute!! I love the pink pig! He's totally fly, that H-Dawg. And you are looking pretty fly, too, momma. Owwww so adorable. A lot smarter dressed than any older man Iv seen in a long time! I mean....his lip in that pic is totally priceless. Love it! He's precious! 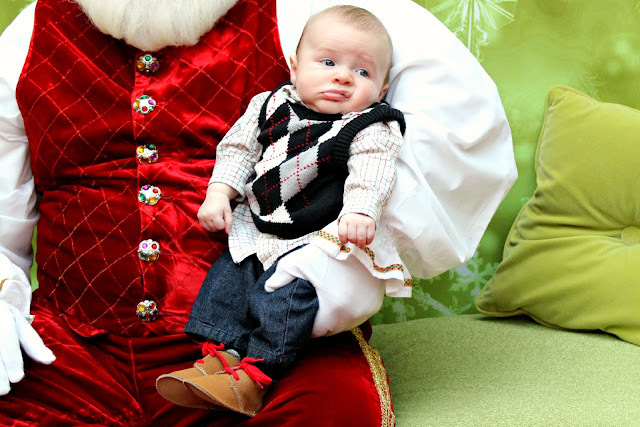 He's totally got the elvis lip in the closeup pic :) Enjoy this first Christmas with him. They only get better and better! Ah, making memories! I haven't done the Pink Pig in years... may have to revisit that with all my BIG kids. :) HDawg is too stinkin' cute... Christmas hugs to you and yours!